I have had my eye on this watch for awhile... and in my opinion, it is the nicest of the Michael Kors watches I have seen. I do not wear it as an every day watch, I wear it with dresses mainly as it's a very detailed, beautiful watch. While it doesn't bother me, it may bother some... there are no numbers on the face. Iconic designer Michael Kors is one of the top names in American fashion, with fashion forward styles and bold designs. 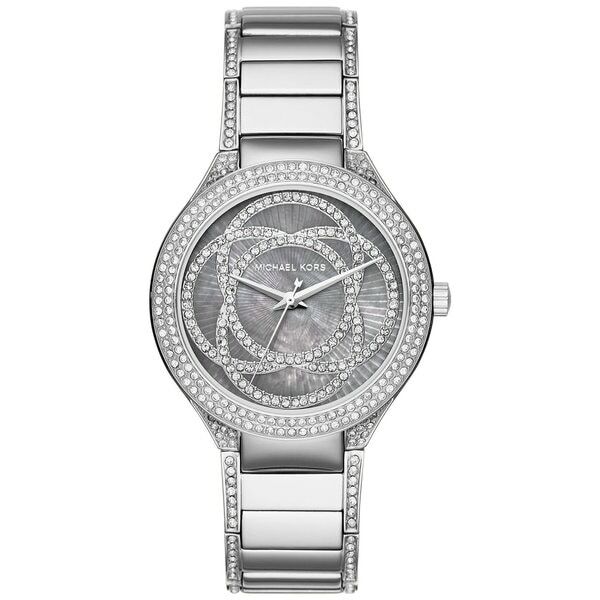 This women's watch from the Kerry collection features a stainless steel bracelet and mother of pearl dial. Dimensions Case: diameter 38mm thickness 9mm. Band: width 20mm. Beautiful Watch. I bought it as a gift for a good friend. Once she sent me the photo of it on her wrist I knew it was perfect and now I want one for myself. 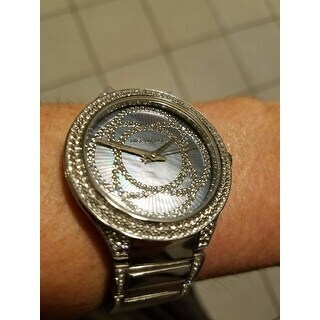 This watch is very pretty and has just the right amount of bling. I just was looking for a watch with a larger face, more of a boyfriend type watch. This Is more a medium size. Good quality watch. I bought this for my daughter’s birthday. It’s got just the right amount of bling plus it’s silver whic matches more of what she wears. She did have to get a couple of links removed for a better fit. I love the watch I get a lot compliments!!!! Pictures do not do this watch justice! Very beautiful and elegant!!! "Are the crystals surrounding the watch face and along the watch band shielded by a clear-coat of any kind, or are they just out in the open? I am pretty hard on my watches and do not want to lose any of the crystals, as that would ruin the entire piece."